Don`t forget zone 2 and the former zone 2 + 3 fares! Old and young, rich or poor, I see people who don’t pay when travelling for one or two stops on trams, and why would they at the current price of $4.10. Aside from taking a short one off trip, I think our public transport fares are quite cheap. Oh yes, your graphs are terrific. Thanks for the effort. @Tom, there are dozens, perhaps even hundreds of fare combinations when you take V/Line and concessions (which haven’t always been half of the full fare) into account. I aimed to do three of the most important ones, particularly to show the effect of the zone changes over the years. They would make the graphs more complicated, zone 2+3 in particular. The rise has also been steeper for journeys that were covered by short trip/rail plus 2. Ditto for trips where the return trips started between 2hours to 2:59 minutes after the start of the first trip and no other trips were taken that day. Squeeze the shorter trips has very much been a major fare strategy for years. Also off peak multi-zone travel has got more expensive with the end of off-peak fares on weekdays. I suspect these strategies have hurt people on some of the lowest incomes most and have not been well targeted at crowding (at least on trains). I wonder if it’s worth charting registration and fuel excise growth on the same graph? It’d be interesting to see the growth in PT fares vs motoring costs. Hard to bundle those costs I guess, with tolls, parking costs etc. Zone 2 only fare – $2.94, so now not rounded (5% increase). Regional town fares (single zone) – no increase again. Regional V/Line fares continue to get out of whack – Geelong peak fare up 60 cents, but no increase for single Zone 4, and only 20 cent increase for the rest of the trip (Zone 1/2). If that makes sense! Talking about CPI – CPI includes an index for urban transport fares, which includes taxis as well, and broadly takes into account changes in individual fares – i.e. it would be pricing individual fares to contribute to the index. 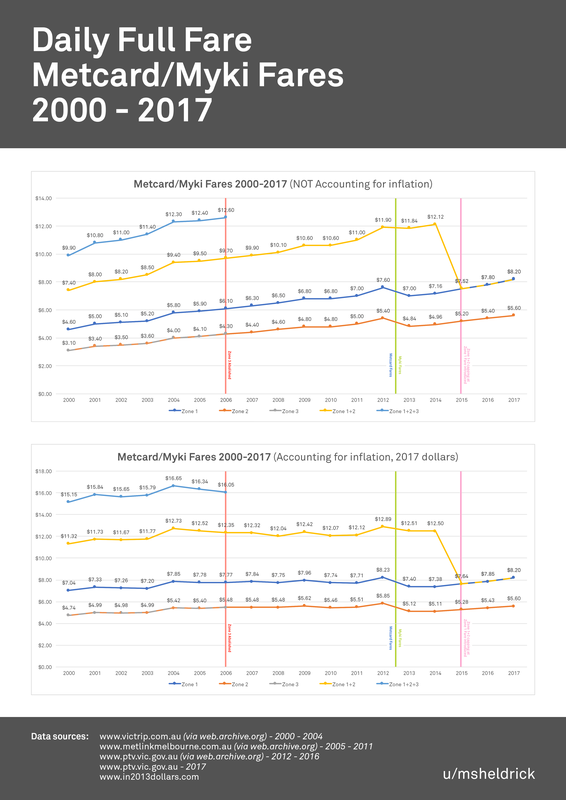 Looking at year-on-year for the March Quarter, 2017 rose 3.8%, 2016 rose 1.4%, 2015 fell 15.4% (obviously the impact of the fare structure changes), 2014 rose 1.7%, 2013 rose 5.5%, 2012 rose 9.0%, 2011 and 2010 no rise (was 2011 the year of the delayed rise?) So in years where this increase is less than the standard fare increase, there would’ve been structural changes to the fare system somewhere (e.g. the full introduction of Myki). There’s also a CPI index that covers registration and similar charges, including tolls, licencing, parking, RACV membership – these probably go up in July in the main, but if I take the same comparison, there have been some large increases – 2015 up 8.7%, 2013 up 13.1%, 2011 up 13.9%. I liked the spin in the PTV news item comparing the Melbourne daily zone 1 & 2 fare of $8.60 with the so called Sydney daily fare of $15.40. It is total nonsense of course because the Sydney fare is a cap, most people would pay less than that, & covers locations that are as far from Sydney as Ballarat, Bendigo & Geelong are from Melbourne. An interesting comparison, the off peak single fare from Sydney to Wollongong is $5.95 while the equivalent fare from Melbourne to Geelong, a similar distance, will be $9.24 from January. The ill considered idea of making Melbourne a single large zone has badly distorted our fares. Look at the difference in fares once you cross the boundary from zone 2 to zone 3. The Melbourne daily fare is a cap as well and the Opal cap is the only daily Sydney fare cap (as far as I can tell from their website) and thus the only cap that covers the equivalent of the Melbourne zone 1+2 cap. Melbourne also has a zone 2 cap as well ($5.88 from January). This means that making multiple trips in Sydney could cost up to $15.40 that would cost only $8.60 or (if entirely in zone 2) $5.88 in Melbourne. The Melbourne-Geelong fare also includes Geelong bus travel and Melbourne suburban travel, on any mode (train, tram or bus), at each end of the journey (commencing within 2.5 hours of the start of the journey), whereas the Sydney-Wollongong fare does not include non-train travel (buses, light rail and ferries). A bus trip over 8km at each end of a Sydney-Wollongong trip would cost an extra $5.22 (2 x $4.61 – 2 x $2 transfer discounts), for a total of $10.17. 1.5 zones for Melbourne has distorted our fare network, especially for shorter trips. Daily caps are also a problem when mixed with regional fares and non-standard travel patterns. The daily cap is, I assume, meant to equate to a return trip – you effectively pay half-price if you do the trip within 2 hours, and you pay no more if you make a third trip. But you can end up paying more than the daily cap for Zone 1/2 travel if adding a regional journey (e.g. Geelong, Zone 4). Zone 1-4 daily cap is currently $25.20 – which you will only pay if you’re making a peak return trip, or something a bit non-standard. Like this – Zone 1 (= $4.10), then change trains (go through the barriers first) and travel Zone 2-4 (=$4.80 contribution to the cap, but fare is $3.36). Return Zone 4-2 (=$4.80 contribution to the cap, but fare is $3.36), then change trains and travel Zone 1 (=$4.10). Make a third trip in Zone 1 more than 2 hours later (=$4.10), and make a fourth trip in Zone 1 more than 2 hours later again (=$3.30, to reach cap). So you’ve paid $15.60 to travel in Zone 1 across the day, and a total fare of $22.32, with no peak travel. Compare that to an off-peak return trip to Geelong, which costs $17.64. The PTV website lists off-peak daily fares – there is no such thing, as daily caps are worked out on peak fares. How would that compare to a similar trip pattern between Sydney and Wollongong? After about 4 decades of wages generally rising every year in line with inflation, this has generally not been the case, during the present century. So I don’t think the graph showing the fares adjusted for CPI is particularly relevant. Fares are still up more than 50%. If I’m reading the new VLine fare guide correctly, they will now charge peak rates for any journey that includes Zone1 during the peaks, whereas it used to be just for people traveling to Melb in the morning and out of Melb in the afternoon.